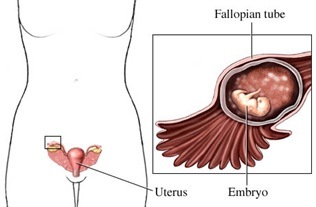 Implantation of a fertilized ovum outside the uterine cavity, most commonly in the fallopian tube. Good maternal prognosis with prompt diagnosis, appropriate surgical intervention, and control of bleeding. Poor fetal diagnosis (rare incidence of survival to term with abdominal implantation). About 33 % chance of giving birth to a live neonate in a subsequent pregnancy. Incidence: about 1 to 200 pregnancies in whites; about 1 of 120 pregnancies on nonwhites. Complications: rupture of fallopian tube, hemorrhage, shock, peritonitis, infertility, disseminated intravascular coagulation, and death. Transport of a blastocyst to the uterus is delayed. The blastocyst implants at another available vascularized site, usually the fallopian tube lining. Normal signs of pregnancy are initially present. Uterine enlargement occurs in about 25% cases. Human chorionic gonadotropin (hCG) hormonal levels are lower than in uterine pregnancies. If not interrupted, internal hemorrhage occurs with rupture of the fallopian tube. If fallopian tube ruptures, sharp lower abdominal pain, possibly radiating to the shoulders and neck. Possible extreme pain when cervix is moved and adnexa palpated. Serum hCG is abnormally low; when repeated in 49 hours, the level remains lower than the levels found in a normal intrauterine pregnancy. Ultrasonography may show an intrauterine pregnancy or ovarian cyst. Laparoscopy may reveal a pregnancy outside the uterus. Laparotomy and salpingectomy if culdocentesis shows blood in the peritoneum; possibly after laparoscopy to remove affected fallopian tube and control bleeding. Micro-surgical repair of the fallopian tube for patients who wish to have children. Laparotomy to remove the fetus for abdominal pregnancy. Determine the date and description of the patient’s last menstrual period. Monitor vital signs for changes. Prepare the patient with excessive blood loss for emergency surgery. Administer prescribed blood transfusions and analgesics. Administer Rh (D) immune globulin (RhoGAM), as ordered, if the patient is Rh negative. Encourage the patient to express feelings of fear, loss, and grief. Refer the patient to a mental health professional, if necessary, prior to discharge.